It has been three months since my last post. Where has the time gone? I do know part of the answer. My siblings and I have been helping our mother prepare for the next step in her journey: moving from her apartment in a large retirement community into a smaller senior residence. It is a bittersweet time, in which the sadness is balanced with reminders of the past that make me smile. Like my mother's battered recipe collection. For the past few years, Mom has been trying to unload possessions with a zeal that often feels premature. But she had a surprising reluctance to surrender her green metal recipe file box. At ninety-three, her kitchen activities are limited to making coffee and toast. Still, she wasn't quite ready to let go of her recipes. Finally she agreed. Now my mother's dark green metal box sits in my kitchen, on top of own light green box. They are twins. Sisters. Mother and daughter. 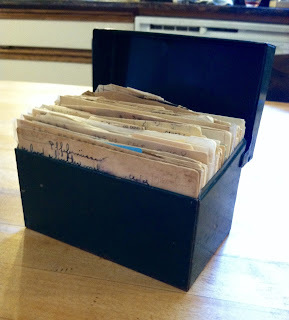 My mother's old recipe box felt like a treasure chest. A culinary vault. The contents turned out to be a mixed bag. Yellowed newspaper clippings, torn out in haste, just in case. Recipes from friends. A large collection of improbable dishes that I call "teachers' lounge" favorites. But there were some true gems in there, too. Sentimental favorites from my childhood, mostly sweets of one kind or another. I had copied some of them into my own collection. Pfeffernüsse. Danish Puff. Murbeteig. I hadn't made them in years. 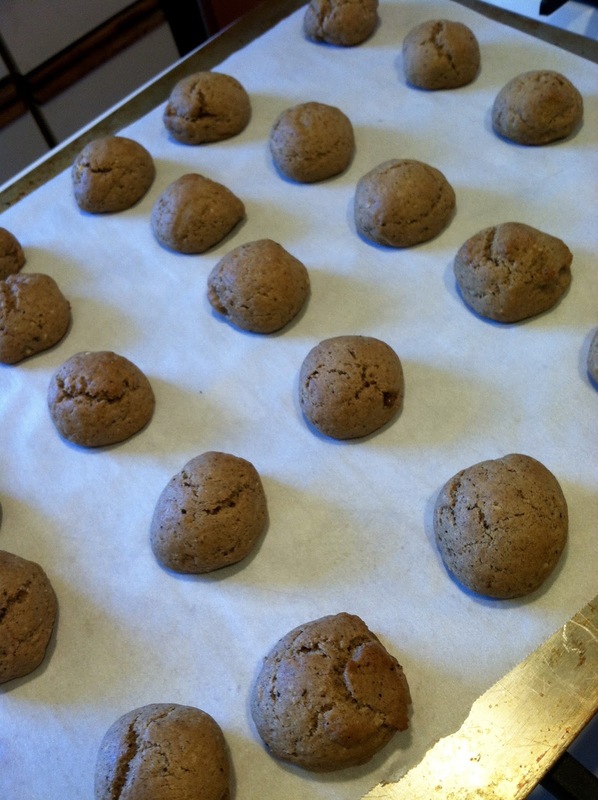 The first recipe I resurrected from the vault was my mother's pfeffernüsse (pepper nut) recipe. It was a Christmas cookie staple at our house. Spicy nuggets, not too sweet, heavily coated with confectioners' sugar. Made in advance, so the cookies turned rock-hard. I have no idea where my mother got her recipe. Authentic German recipes include ingredients that never appeared in my mother's Midwestern kitchen. Citron. Anise. Rum. Black pepper. I have found a pfeffernüsse recipe in in one of my vintage Slovenian American cookbooks, Woman's Glory. 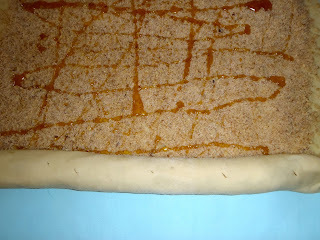 But it is quite different from my family recipe: no shortening, and the cookies are left to sit out to harden before baking. I copied my mother's recipe into my own collection many years ago. But it never turned out like hers. My pfeffernüsse were bland and too soft. Definitely underwhelming. Now that I had Mom's original recipe, I could see where I had gone astray. The recipe she had copied called for cake flour. She had added a notation, about how to substitute all-purpose flour plus something else. I had overlooked the "something else" (probably cornstarch) and ended up with a reduced quantity of all-purpose flour. No wonder my cookies were too soft! The other problem: My mother had increased the spices. Unfortunately, I had misread and miscalculated, in cutting down her very large recipe (8 cups of flour!) to more manageable proportions. So I ended up with underspiced cookies. Below you will find an image of my mother's pfeffernüsse recipe, followed by my own translation. Combine flour and spices. Set aside. Melt butter, let cool slightly. In large bowl, beat butter and sugar (and honey, if using), add eggs and vanilla and beat. Add soda dissolved in water. Stir in dry ingredients. Form into balls about the size of a walnut. Bake at 375 F for about 15 minutes, or until brown. Shake in a bag with confectioners' sugar. What a great discovery for you to have made - those old recipe boxes are such treasures! Thank you for the kind words, Mary Lou!